Maxpedition WOLFSPUR Crossbody Shoulder Bag FREE SHIPPING! 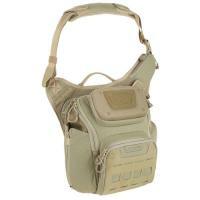 The Maxpedition WOLFSPUR is a cross-body shoulder bag designed for effective, accessible concealed carry. Its rear CCW compartment is loop-lined so that you can secure a holster, and features a large zipper opening with positive grip pulls to speed up your draw. The bag also includes a securely lockable main compartment with a padded tablet pocket, a semi-rigid fleece-lined pouch to protect fragile items such as sunglasses, and an expandable holder for a water bottle up to 32 ounces. The WOLFSPUR is made from a blend of hex ripstop and plain weave nylon, giving it extreme resistance to wear and damage, and features ATLAS Attachment Lattice System straps for use as part of a modular gear carrying system. A padded strap and 3D mesh back panel make it comfortable to carry on its own as well. ©2002-2019 CopsPlus.com: Maxpedition WOLFSPUR Crossbody Shoulder Bag FREE SHIPPING!